It was corporate skulduggery at its most audacious. Last September Frank Newbould dined at Scaramouche, a swanky downtown Toronto restaurant, with a businessman who said he would like to hire Newbould as an arbitrator. In reality, this was a ruse to engineer an attempted sting on Newbould, a retired Ontario judge, as the National Post reported. Newbould’s would-be client worked for Black Cube, a Tel Aviv-based business intelligence firm, staffed with former Israeli intelligence agents, that has attracted notoriety for its work for disgraced Hollywood producer Harvey Weinstein, among others. As Newbould and the man conversed, another Black Cube operative was secretly photographing them. Newbould’s dinner companion also surreptitiously taped the conversation. During the dinner, and at a prior meeting as well, the private eye seemed to try to elicit a reaction from the former judge by making rather loaded references to the “Jewish lobby” and “the Jewish way of doing things . . . all the time trying to take more than they should and more than agreed.” The Black Cube operative’s apparent goal? To provoke the former judge into saying something anti-Semitic, as the National Post reporter who was offered information about this meeting later reported. But after reporter Christie Blatchford was approached by Black Cube with the recording of the meeting, she found that the 74-year-old retired judge hadn’t agreed with the statements and didn’t say anything offensive about Jewish people. She ended up reporting that Black Cube had tried to entrap Newbould on behalf of Catalyst Capital Group Inc., a $4.3 billion private equity firm in Toronto that was founded by Newton Glassman, who is Jewish. Catalyst has since denied that it hired Black Cube to do a sting on Newbould. Catalyst, which runs five primary investment funds and whose clients include some of the largest institutional investors in the United States and Canada, appealed that decision. Had Black Cube caught Newbould making an anti-Semitic remark, an appellate court might have considered reversing the judge’s decision, reasoning that it had been motivated by prejudice against Glassman. In February the appeal was dismissed. While Judge Newbould had initially ordered Catalyst to reimburse West Face CA$1.23 million for its legal expenses, that sum will likely increase since Catalyst’s appeal was denied. Newbould’s ruling is likely to influence another judge’s opinion in another Catalyst suit, charging West Face with misuse of confidential information, conspiracy and breach of contract. 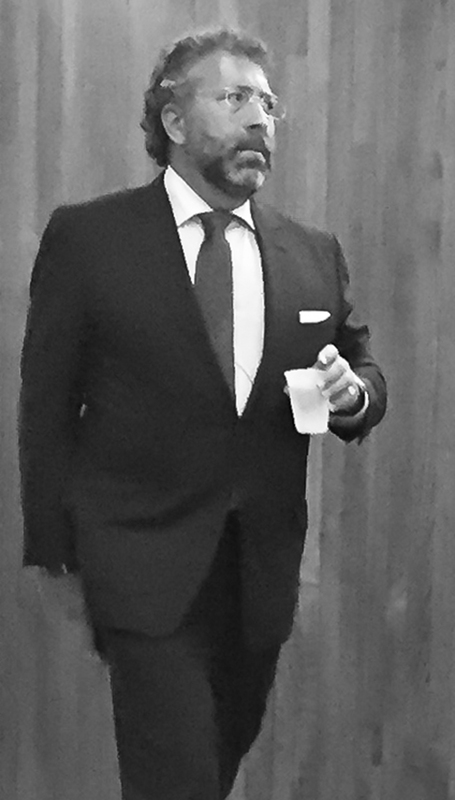 Glassman informed some of Catalyst’s limited partners last year that he saw a “reasonable likelihood” of garnering a huge payout from this suit: In an investor presentation, Glassman said the litigation was “extremely material” and he listed its expected outcome as an unrealized gain of more than $448 million. But by losing the appeal in the first case, Catalyst’s chances of a big payout are slim. Yet Catalyst has brought two other lawsuits against West Face that are still playing out in court. In the most recent suit brought last November, Catalyst made its most outrageous claims against West Face as well as others — with CA$455 million in damages sought. The suit has argued that the defendants were part of a “Wolfpack” that had conspired to orchestrate a “short and distort” campaign against Catalyst’s publicly traded subsidiary, Callidus Capital Corp. 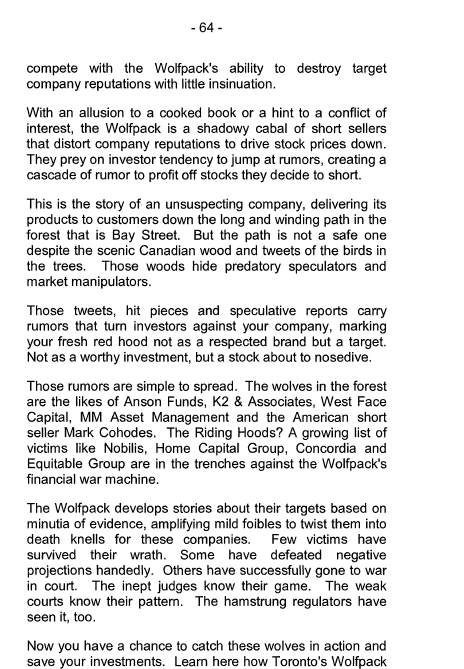 This “Wolfpack” is said to include a wide array of participants: a Wall Street Journal reporter, former Callidus borrowers, hedge funds and stock research and investment firms. The suggestion is that by working together and coordinating their efforts, these individuals and entities were acting like a “wolf pack” in trying to undermine Catalyst. 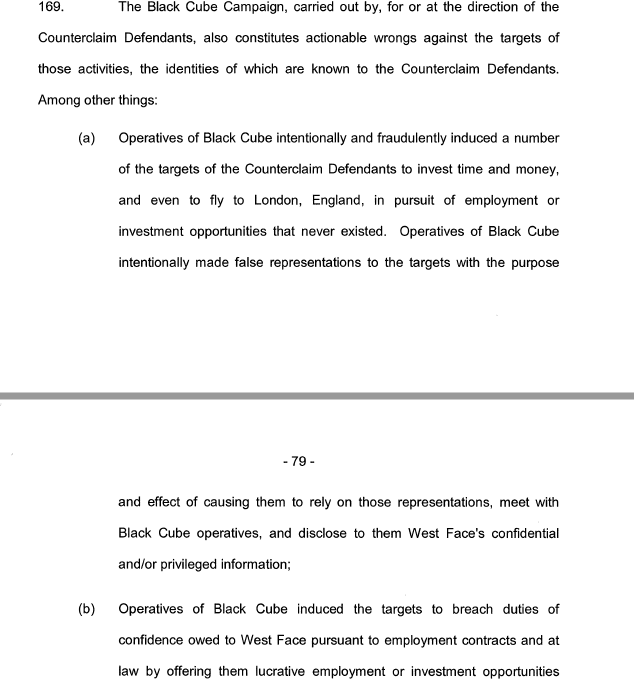 Black Cube allegedly had some interesting help: In West Face’s statement of defense and counterclaim, it accused Catalyst of hiring PSY Group Inc., a Cyprus-based, Israeli-directed intelligence services company. 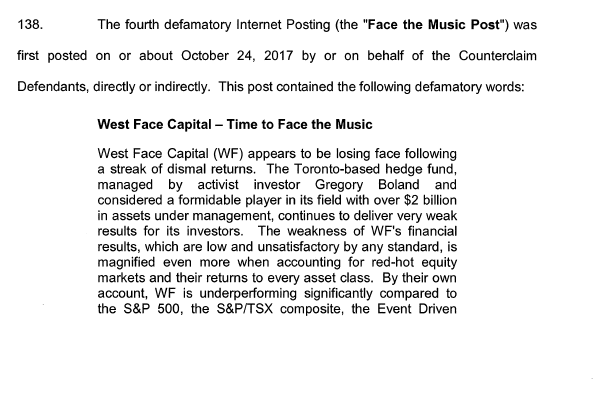 West Face, which currently has an estimated CA$2 billion under management, has claimed in a legal filing that PSY Group is little more than an internet-based trolling operation that has planted and spread fake news and video stories about Greg Boland, West Face’s CEO. 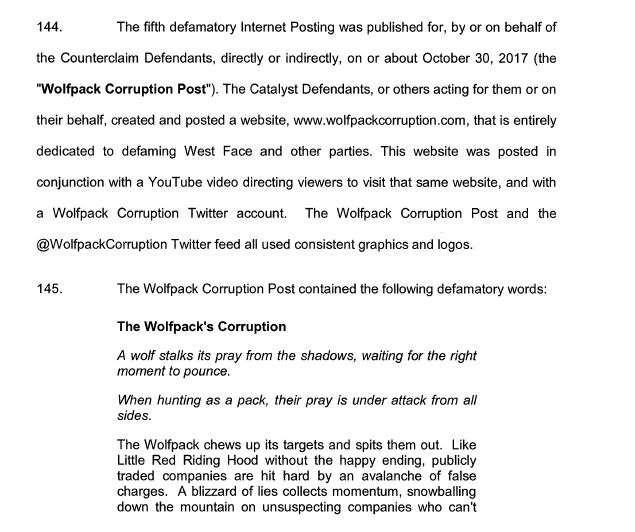 West Face has also claimed that PSY Group directed the creation of a webpage that alleged the existence of a “Wolfpack corruption” conspiracy targeting Catalyst. 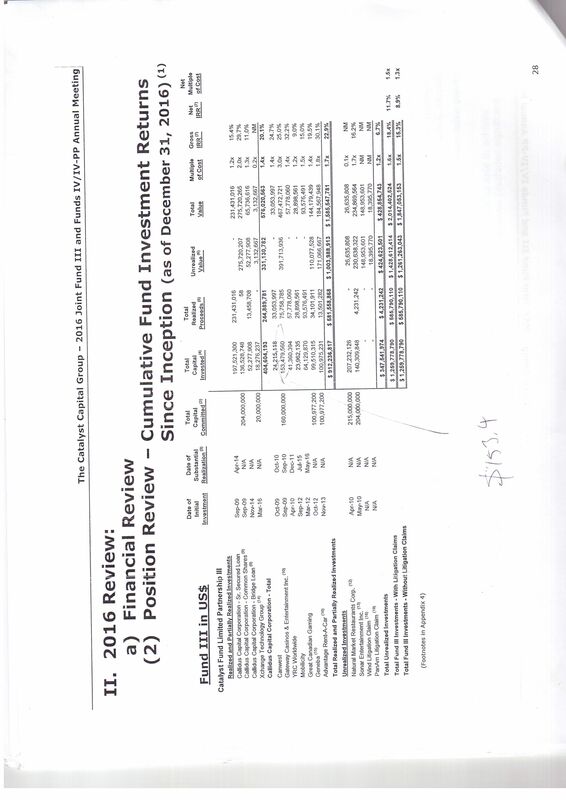 Another rationale for West Face’s skepticism was its view, as shown in a court filing, that in late 2014 Callidus’ disclosures to investors were often highly misleading, particularly upon revealing its balance sheet. Yet Callidus’ analysts said when the company sought bids for the collateral that was taken from borrowers who were unable to repay their loans, Callidus could rarely find buyers willing to pay close to the loan’s value. 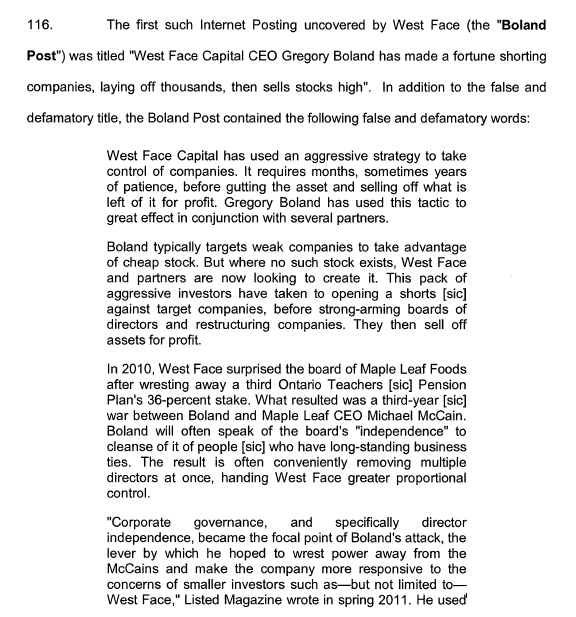 Rather than acknowledge deteriorating loans and writing them off, West Face said Callidus simply recategorized such debts as equity and called them “assets acquired from loans” on its balance sheet and gave few updates. Catalyst even advanced CA$31 million to Callidus this past February and March, shortly before the release of Callidus’ annual report. Though no reason was given, the most likely explanation is the cash helped Callidus avoid violating its debt covenants. Court documents as well as interviews conducted over the past year and a half suggest that Glassman and Catalyst have regularly engaged in business practices that, at best, are well outside Wall Street’s norms. The avalanche of expensive litigation that Glassman has brought to bear against his critics is less a tactic than a tool, one that helps keep at bay many skeptical investors and reporters, who are wary of lawsuits and the likes of Black Cube and PSY Group. 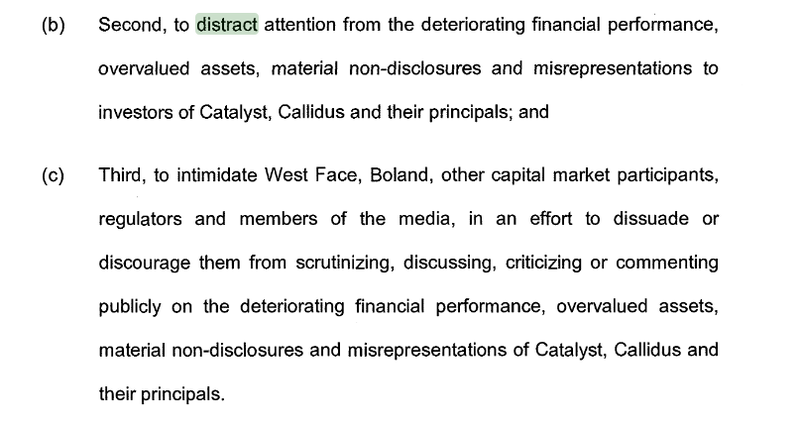 (Catalyst and Callidus also filed a defamation suit against two Wall Street Journal reporters; Dow Jones, the paper’s parent company; and a Callidus borrower.) In turn, the litigation allows Callidus and Catalyst to operate without the headaches and awkward questions that public scrutiny can bring. The son of a surgeon, Glassman is an alumnus of the University of Toronto’s law school and the University of Pennsylvania’s Wharton School. He eventually headed to Wall Street, joined the staff of Cerberus Capital Management LP in 1997 and rose to the rank of a managing director. He oversaw the fund’s telecommunications portfolio and its Canadian investments. In 2002 Glassman left Cerberus and returned to Toronto, where he set up Catalyst. He partnered with a banker, Gabriel de Alba, and later a Toronto lawyer, James Riley. Most fund managers would give their front teeth for results like that, but Glassman appears to want more — much more — and that’s where Callidus Capital Corp. has come in. Toronto businessman Sam Fleiser founded Callidus in 2004 and Glassman directed Catalyst to buy a controlling interest in the company three years later. Catalyst provides the capital for Callidus’ loans. Considering the risk involved in making such loans, Fleiser ran the company conservatively. During the five years prior to 2011, just CA$4 million in losses were written down on three loans, out of an estimated CA$600 million in lending — even though Callidus charged interest rates as high as 18 percent. But in 2011 Fleiser departed from Callidus. Upon taking the helm of Callidus, Glassman had two very specific goals: to take Callidus public and grow its loan book considerably. While this might have seemed like a good idea given the success of Callidus under its previous management team, things turned out very differently. Sam Fleiser was discerning in selecting borrowers; Newton Glassman appears to have been anything but. Nonetheless, Callidus’ growth was truly extraordinary in the initial years of Glassman’s leadership: In 2012 the company had CA$132 million in gross loan receivables. Two years later this metric had mushroomed to CA$823 million, with the size of loans climbing as well. And by the end of 2015, Callidus had 39 loans for an amount totaling CA$1.2 billion on its books. But were all the new loans sound? Underwriters tasked with marketing Callidus to investors were likely asking that very question in April 2014 as they examined its IPO. 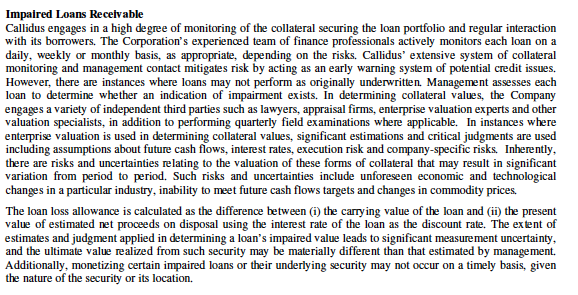 To allay these concerns, Catalyst promised it would guarantee all the loans Callidus made before the IPO. 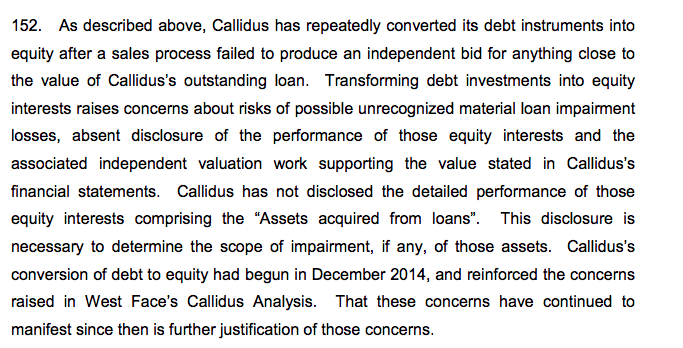 Callidus was relentless in selling investors on the idea that its management team was expert at handling loan risk. Since 2014 Callidus’ filings have been peppered with point-blank assurances that it has made almost no dud loans and its borrowers’ collateral has been more than sufficient to cover any risks. 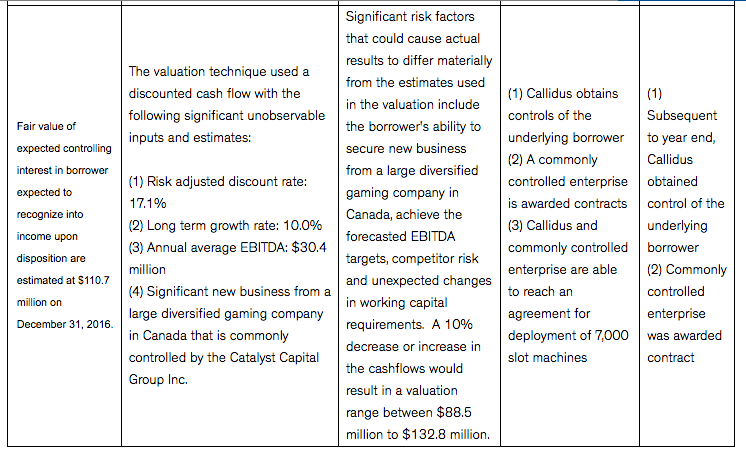 In the IPO prospectus, Callidus claimed to have “no realized losses on principal on Callidus-originated loans after consideration of liquidated collateral costs to settle from 2011 until 2013.” During a November 2014 conference call with brokerage analysts, Glassman boasted, “we don’t have a single loan in the portfolio that’s not performing” and “performing means [paying] current interest and all obligations.” A year later Glassman, on another call, repeated this claim. These assurances have proved very hollow. Callidus’ portfolio, as shown in its 2017 annual report, is a wasteland of troubled loans. Start with Callidus’ loan receivables, which tumbled to CA$247.3 million (a drop of 76 percent from CA$1.02 billion at the end of 2016), as well as its set loan loss provision of CA$217.4 million, which rose 39 percent from CA$134.3 million. Then consider the loan portfolio’s leverage: More than 68 percent of Callidus’ net loans receivable are to just two very troubled companies. C&C Wood Products Ltd., a British Columbia-based timber products company, owes the fund CA$104 million. 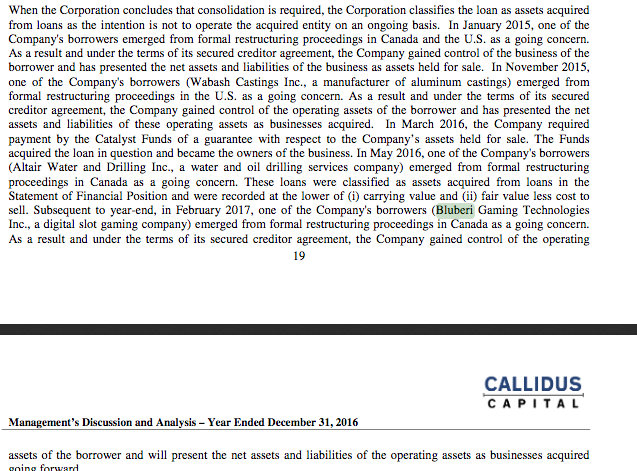 And because of C&C Wood’s inability to repay its loans, Callidus assumed control of the company in November 2017. 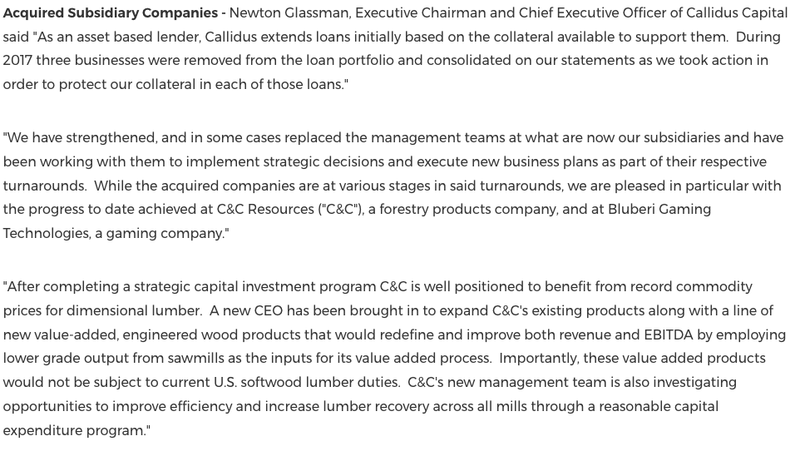 In a press release, Glassman was glowing in describing C&C Wood’s turnaround. 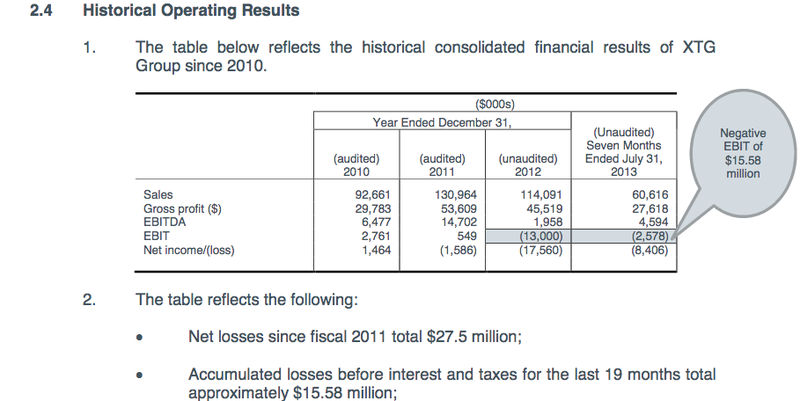 But its financial results — a loss of CA$1.2 million on CA$16.3 million in sales — point to a different reality. The other company is Horizontal Well Drillers, an Oklahoma-based oil-drilling outfit that has received $216.9 million in loans from Callidus. If Horizontal’s name rings a bell, this is probably because of the attention it received in September 2016 when Venezuela’s state-owned oil company, Petróleos de Venezuela SA, announced that Horizontal (in conjunction with Halliburton) had been awarded a contract worth $3.2 billion to drill 480 wells. The announcement immediately raised investor eyebrows given Horizon’s small size and the fact that, per a CNBC report, Venezuela isn’t paying its immense debts to even the largest of the oil services companies. This situation has forced the likes of Baker Hughes, Schlumberger and Halliburton to set aside hundreds of millions of dollars to cover prospective losses from their uncollectible debts. Callidus has taken a dim view of Horizontal’s prospects and now values its loan at CA$69.1 million, a write down of CA$131.9 million. 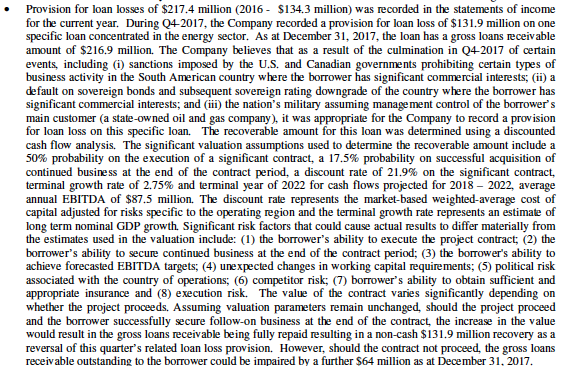 And the financial pain for Callidus and its investors from this loan probably isn’t over yet: Buried at the foot of a lengthy disclosure in the 2017 management discussion and analysis statement is the acknowledgement that if the Venezuelan contract doesn’t materialize, as much as $64 million more could be written down. So what happened to Glassman’s assurances to investors about performing loans and a robust cushion of collateral? Under his leadership, Callidus’ lending practices have seemingly defied logic at times. Many borrowers, in interviews and legal filings, have complained that Callidus changes its loan terms just as negotiations are ending, then seeks personal guarantees from the borrower’s management. Moreover, some of the borrowers have claimed that once a loan is signed, Callidus then fails to provide them sufficient financing. As a result, at least six commercial borrowers (and likely more) have seen their operations nearly collapse, only for the companies to then be rescued by Callidus. Alken Basin Drilling Ltd.’s history offers an example of this scenario. In 2013 Kevin Baumann bought the Canadian water-well drilling firm in Bentley, Alberta. A year later, when he needed credit after his business fortunes sharply declined, Baumann turned to Callidus, which agreed to lend him as much as CA$28.5 million. Baumann is now being sued by Callidus for refusing to deliver his personal guarantee to cover the losses accrued. In March 2015 Callidus demanded repayment of its loan, even though Alken was not in breach of its loan agreement, Baumann said. Baumann tried to file for creditor protection for Alken. The following month, he said, he was pressured to resign and Callidus then inserted its own management team. 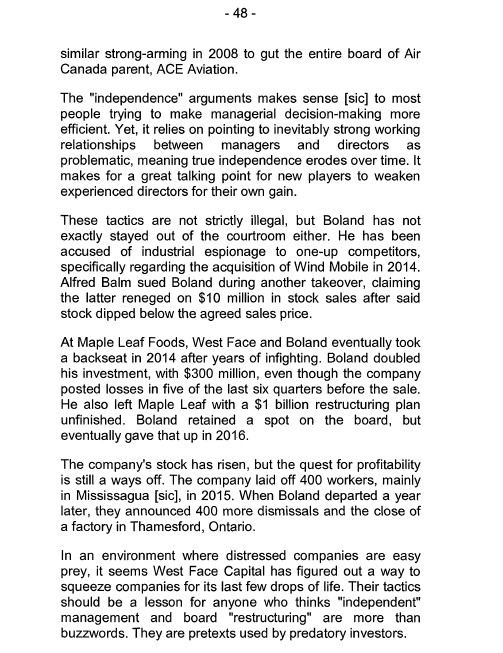 The new president, Scott Sinclair, is an interesting choice to replace Baumann, given the 2009 sanction he received from the Ontario Securities Commission, which included a CA$15,000 fine and a 10-year ban on serving as a director of publicly traded company. Alken was put into receivership in March 2016; Callidus claimed Alken owed it CA$27.4 million. But its assets were worth only CA$10.6 million, according to an April 2016 report from the receiver. Soon after this, another Callidus-owned company, Altair Water and Drilling Services, took over Alken’s remaining assets through a credit bid of CA$24.2 million that added up to an estimated CA$17 million loss on the loan. Whatever drove Altair’s bid, it wasn’t value. Yet, according to Baumann’s March 2017 legal brief, just before the receivership went into effect, Altair and Alken received two memorandums of agreement for a well-drilling contract in Egypt that Sinclair allegedly described to Callidus as potentially worth CA$200 million. This begs the question: Why place a company in receivership just as it was gaining such large contracts? Baumann has an answer for that. He claimed in a court filing that these Egyptian memorandums were withheld from other potential Alken suitors because the contract “would have significantly increased the value of Alken’s assets available for sale in the receivership process” and would have decreased the amount that Callidus demanded from him personally in the loan guarantee. Another borrower accused Callidus of lending money under false pretenses. In 2014 Callidus agreed to lend $34 million to Esco Marine Inc., a ship recycling company in Brownsville, Texas. Esco’s managers put up personal guarantees. And Esco’s team has also said Callidus changed the terms of the loan at the last minute and then balked at providing the company sufficient funds to continue its operations. (Callidus denies this allegation.) In 2015 Esco filed for bankruptcy, with Callidus pursuing Esco’s management for some of the money promised under the personal guarantees. Last year a U.S. district court judge in Texas wrote in an opinion that there was sufficient evidence to indicate that Callidus had engaged in “fraudulent inducement” in failing to fulfill all of the loan’s original terms. Andrew Levy, Esco’s CEO, settled his suit against Callidus in return for cooperating with its litigation against the “Wolfpack.” In a brief interview with the Southern Investigative Reporting Foundation, Levy said that while “we dislike Newton Glassman,” the agreement with Callidus prevented him from discussing the terms of the settlement. 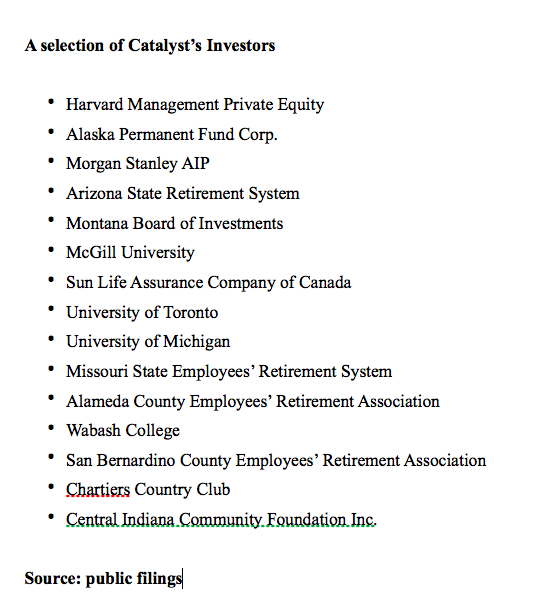 But that’s not the half of it: At the annual meeting for the limited partners of Catalyst Fund III and Catalyst Fund IV held in April 2017, Catalyst reported having paid $54.82 million for Xchange, with no discussion of the $46.48 million discrepancy. Just as potentially troubling for investors, however, is the fact that in the same presentation Xchange’s total value was listed as $9.39 million, a $91.9 million loss in value in just over a year. 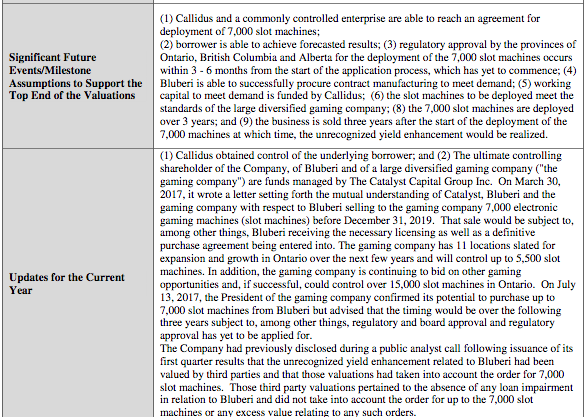 Callidus’ investment in Bluberi Group, a Drummondville, Quebec-based developer of games for slot machines, has been even more problematic. 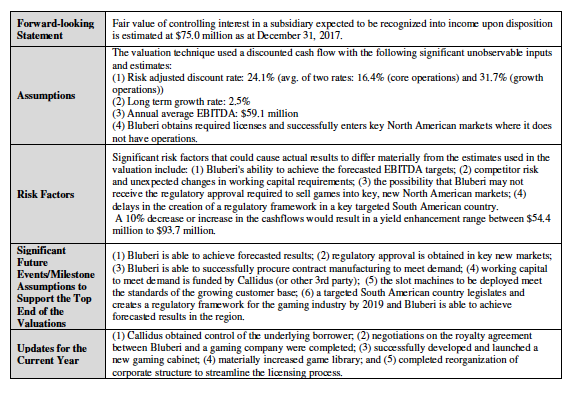 In November 2012 Callidus provided Bluberi a CA$24 million loan on the basis of a business plan that projected selling 3,300 slot machines and generating by the end of 2013 CA$25.5 million in earnings before interest, taxes, depreciation and amortization, or EBITDA. The projections proved to be more like daydreams, however, as Bluberi installed just 324 slot machines and burned through CA$2.6 million in cash. Despite the missed projections, Callidus continued to extend credit to Bluberi. By November 2015 Bluberi owed Callidus CA$84.1 million. 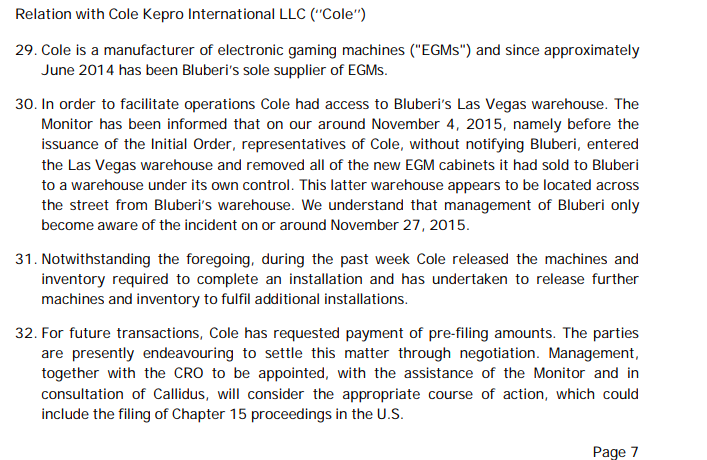 Early in that month, employees of Cole Kepro International, which makes the slot machines that house Bluberi’s software, entered a Bluberi storage facility and repossessed all the gaming units Cole Kepro had recently sold Bluberi. This brought Bluberi’s business to a virtual halt. Bluberi’s CEO then dismissed most of the staff of the company and filed for creditor protection. A report by Ernst & Young, the court-appointed bankruptcy monitor, portrayed Bluberi as being in financial and operational chaos, with a negative equity of CA$52.8 million after incurring losses of CA$14.1 million in 2013 and CA$22.8 million in 2014. 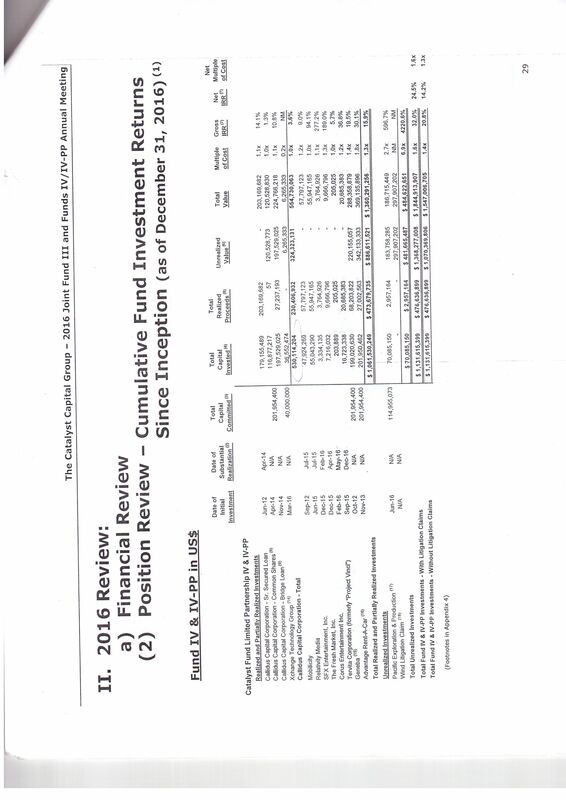 By the middle of November 2015, according to the receiver, Bluberi had just CA$54,000 left in its bank account. In March 2017 when Callidus released its results for fiscal 2016, it disclosed that it had taken over Bluberi and appraised the company at CA$110.7 million, a value with little discernible economic basis whatsoever. Callidus’ reasoning? A “large, diversified gaming company” had signed “an agreement to deploy 7,000 slot machines” that Bluberi would be building. The “large, diversified gaming company” said to be buying all those machines was Gateway Casinos & Entertainment Ltd., a company controlled by Catalyst that’s not in any shape financially to pay for an order that large. In 2012, Gateway disclosed in a prospectus that all its gaming equipment was purchased and owned by the British Columbia Lottery Corporation; Gateway didn’t have the authority to purchase a single machine. In March of this year Gateway won a concession in another part of Canada: The Ontario Lottery and Gaming Commission awarded Gateway the right to operate as many as 11 casinos in central Ontario. Nonetheless Bluberi can’t capitalize on a relationship with Gateway because Bluberi doesn’t have the requisite Class III license to manufacture and market traditional slot machines. It develops and markets Class II games, which are a variation of bingo installed in slot machines in Native American casinos throughout the United States. It’s unclear if Bluberi is seeking a Class III license. Since March 2017 Callidus’ filings have subtly changed the language used to discuss the agreement for the 7,000 slot machines. 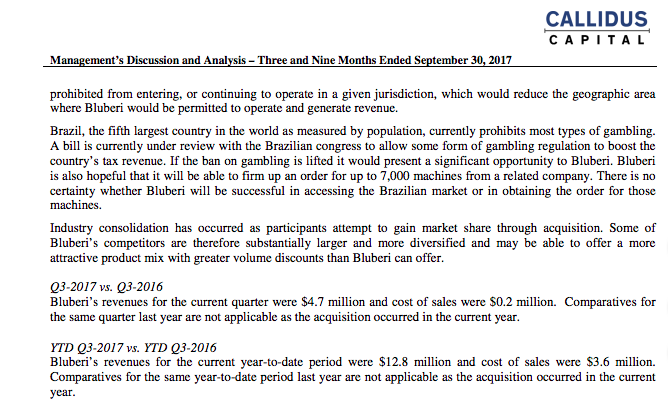 A June 30, 2017, filing refers to it numerous times: There’s a reference to a “mutual understanding” between Catalyst, Bluberi and Gateway that 7,000 slot machines would be sold to Gateway, along with a letter from Gateway’s CEO confirming the company’s “potential to purchase up to 7,000 slot machines from Bluberi” over a three-year period. And Callidus’ management discussion and analysis for 2017 contained no reference to a Bluberi order from Gateway. Still more Bluberi headaches may arrive for Catalyst, however. In a little-noticed court decision on March 16 of this year, Montreal Justice Jean-François Michaud approved a petition by Gérald Duhamel, Bluberi’s founder and former CEO, for obtaining litigation funding so as pursue a claim against Callidus. Glassman’s promises to Callidus’ investors about the strength of the collateral that backs its loans are also problematic. Callidus’ investor filings regularly feature a discussion of the amount and quality of the collateral behind its loans, nearly every time noting that its borrowers’ collateral is equal to or greater than the value of their loan. The implied message conveyed to investors is simple, along lines such as this: “No matter what happens, these loans are protected and so is your investment.” Notwithstanding Callidus’ and Catalyst’s ample disclosures about the loans’ risks to investor capital, the Southern Investigative Reporting Foundation has uncovered instances when a Callidus borrower’s collateral was nowhere close to the loan’s value. 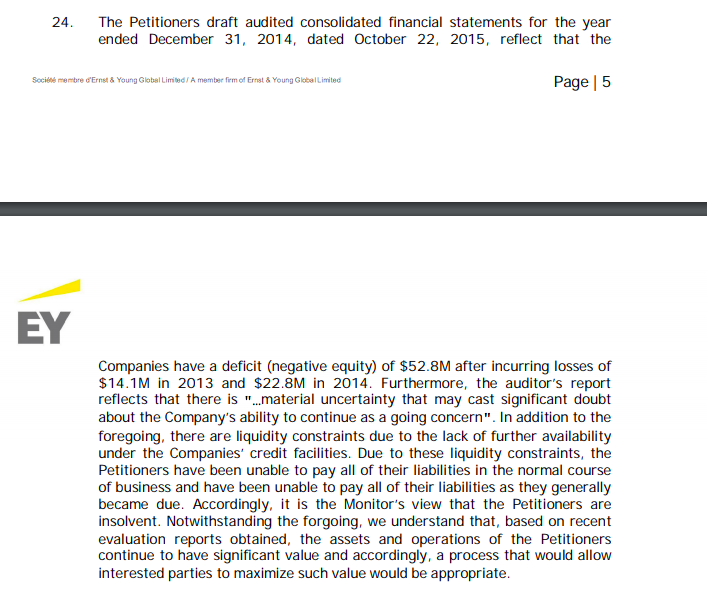 Moreover, Callidus’ filings have repeatedly failed to disclose borrowers’ sharply deteriorating finances. Consider Harvey Industries LLC, a Livonia, Michigan-based auto parts company that in 2012 borrowed $41.5 million from Callidus; Harvey’s collateral was its plant, land and a personal guarantee from the founder. Things went badly, with Harvey closing a plant and laying off staff. By early 2015 the company owed Callidus $39 million. At that point, Harvey filed for bankruptcy protection. A few months later investors would learn how much Harvey had collapsed. A July 2015 court filing valued Harvey’s assets at just $4.5 million to $9.1 million — more than 75 percent less than the figure Callidus had given investors the previous March. 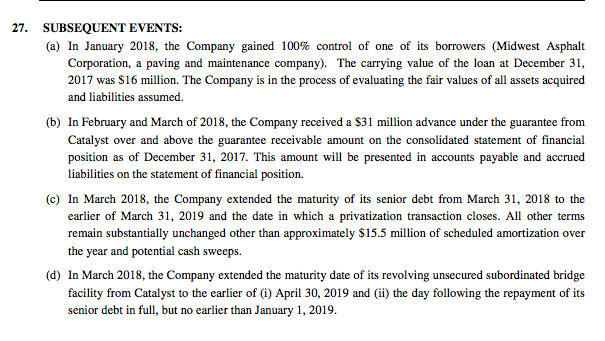 The collateral’s loss in value didn’t represent the only threat that the Harvey loan posed to Catalyst’s limited partners: In June 2015 Callidus took control of Harvey through a $25 million credit bid. Per the bankruptcy receiver’s reports from March through October 2015, Harvey was awash in a sea of red ink, losing an average of $1 million a month. Business hasn’t improved, though, since Callidus acquired the company, with Harvey reporting a gross margin loss of $3.2 million, according to Callidus’ 2017 annual report. Going broke takes a lot of money: Harvey’s monthly debt service, paid primarily to Callidus, was $758,200 over the eight months of bankruptcy, and “professional fees,” primarily paid to lawyers and accountants, were $98,445. It’s not all grim news for Callidus investors, though. From a few brief lines in the Sept. 30, 2017, quarterly filing, they learned that Catalyst bailed out Callidus’ loan to Harvey, which is now called Wabash Castings Inc.
Then there is the case when the collateral for one of Callidus’ borrowers went belly-up. In 2013 Callidus acquired millions of dollars of debt owed to HSBC by Gray Aqua Group, a fish-farming business located on Canada’s Atlantic Coast. At the same time, Gray Aqua entered into a CA$43.5 million credit agreement with Callidus. The terms of the loan called for its repayment in the fall of 2014, but the deadline was later extended to early 2016. In the summer of 2015 sea lice infested some of Gray Aqua’s fish farms, wiping out most of its harvest. A few months later, 380,000 smolt in a hatchery facility had to be destroyed due to disease. As a result, Gray Aqua did not repay the loan by the 2016 deadline. Soon after, the company filed for bankruptcy protection and still owed Callidus CA$55 million. 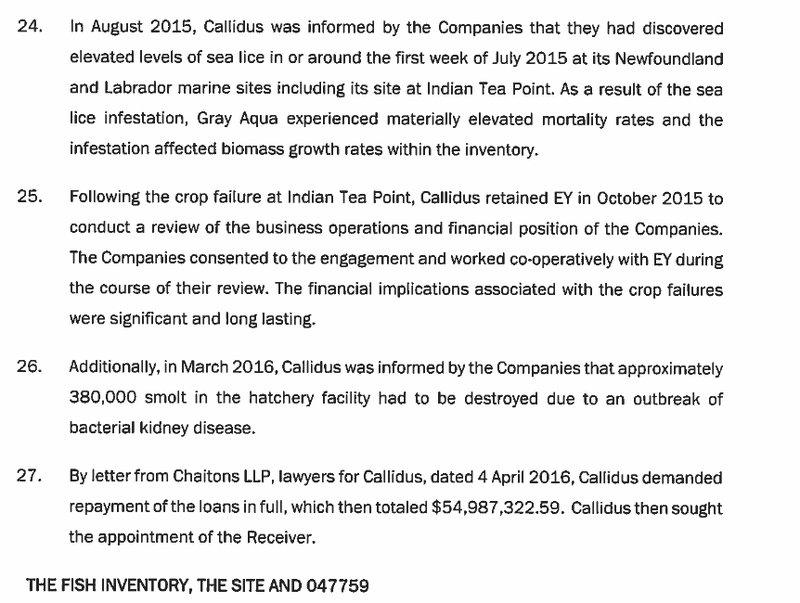 Although the bankruptcy receiver stated Callidus knew about the sea lice infestation in August 2015, it did not disclose this loss in its third-quarter earnings report, as many analysts might have expected. 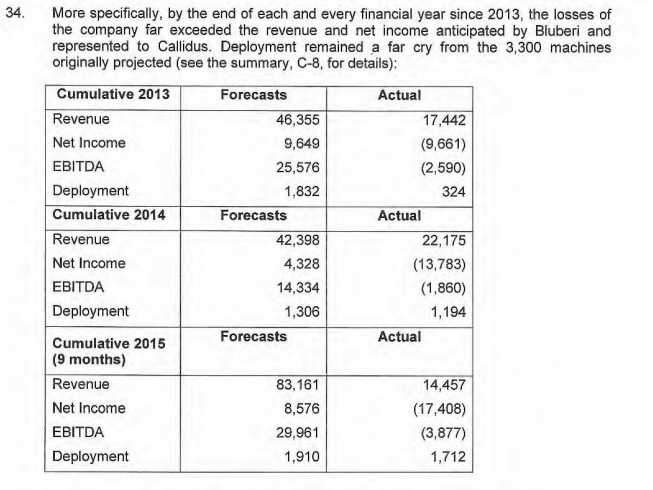 Callidus later reported in its 2015 annual report a pretax loan loss provision of CA$22.7 million. The loss provision was inadequate, and in Callidus’ second-quarter 2016 filing it set aside CA$12 million more for loan losses related to Gray Aqua, bringing the amount reserved to CA$34.7 million. The company was sold that year for a mere CA$15 million. Similar to what happened in Harvey’s case, the losses from Gray Aqua’s and other troubled loans have rarely seemed to meaningfully affect Callidus’ disclosures. In its 2015 annual management discussion and analysis, Callidus reported that its loans in aggregate were backed by collateral representing 172 percent of the loans’ value — and the loans on its internal watch list had collateral representing on average 104 percent of the loans’ value. Catalyst’s holding large portions of Callidus’ stock and serving as the guarantor for many of its troubled loans are not the only looming headaches for Catalyst’s limited partners. Start with Catalyst’s estimated CA$900 million investment in Gateway Casinos & Entertainment; in 2016 stakes in Gateway represented more than 38 percent of the Catalyst Fund II and 29 percent of the Catalyst Fund III. How Catalyst could arrive at its valuation of this huge position is baffling. While the Catalyst Fund III marked up its Gateway positions by almost 50 percent from 2011 to 2016, another private equity firm with a stake in the company, Los Angeles-based Tennenbaum Capital Partners, however, marked down its position 16.4 percent. Though Gateway is clearly in better financial shape than the likes of Xchange and Bluberi, Gateway has a debt load of CA$690 million and, per Moody’s Investor Services, a subprime B2 credit rating. The rating agency’s most recent note expected Gateway to have negative CA$110 million in free cash flow given its schedule of improvements and renovations. To free up cash, Gateway has completed a series of sale-leaseback transactions, with its most recently announced transaction in late February netting CA$483 million. A deal like this to sell and then lease back property is a standard corporate finance tool, typically offering a company a mixed bag of pros and cons: It is a quick way to raise capital, especially for an entity like Gateway that’s used a lot of debt to grow rapidly. 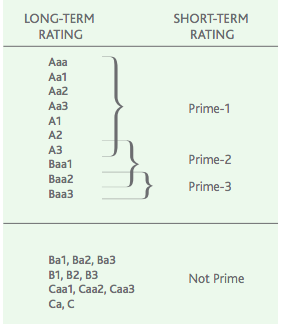 Yet, given the sale of its core real estate assets, Gateway’s future borrowing will likely carry a higher interest rate since the company will have fewer assets to pledge as collateral. Unless a sale-leaseback deal helps a corporation acquire a trophy asset or is used to retire a block of debt, many investors look at this as the financial equivalent of chopping up the deck to keep the fireplace going — a clear signal that financing options are becoming limited. Gateway’s debt holders recently sent a message to Catalyst’s management that their patience is wearing thin. After Gateway negotiated new lines of credit with its lenders, Catalyst sought to use $250 million of the proceeds to pay a dividend (or return capital) to its limited partners — a standard practice for private equity funds of all stripes. But in recent weeks, several investors who own a large chunk of Gateway’s 8.25 percent notes protested, arguing that Gateway’s operations needed the cash more than Catalyst and its limited partners. After some tense negotiations with the noteholders, Catalyst was allowed to take $100 million as a dividend, with a mighty big catch: The bondholders made the fund pay them a consent fee of 2 points (one-half a percentage point more than what was initially agreed upon) or $5.1 million, to receive the money. By cutting its prospective dividend in half and then making Catalyst pay what is effectively a 10 percent fee to obtain the money, investors were sending a clear message about what Catalyst’s priorities should be. Therapure Biopharma Inc., a Canadian pharmaceutical contract manufacturer, is another company that Catalyst has invested in; Catalyst has long touted its prospects only to find the marketplace offering a decisively different value. According to the prospectus for Therapure’s aborted 2016 IPO, it lost CA$10.8 million on just CA$29.5 million in revenue for the nine months that ended on Sept. 30, 2015; during 2012 to 2014, it lost CA$37.16 million on CA$69.87 million in revenue. Therapure also carried CA$32.4 million in debt prior to its September sale for $290 million to a partnership between a Hong Kong-based biotech company and a private equity fund advised by China Citic Bank International. As part of that deal, Catalyst retains the right to Therapure’s plasma product line. 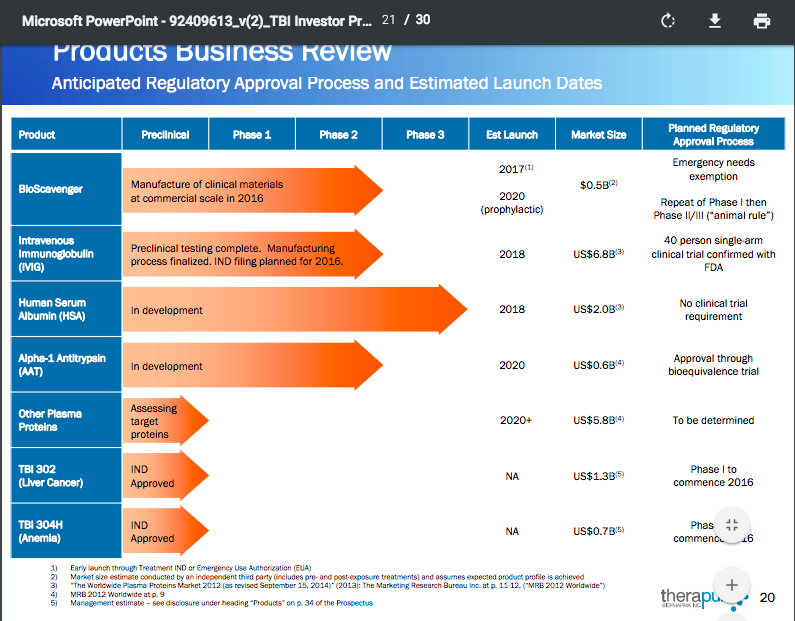 Currently this line seems to be centered on one product that’s undergoing a Food and Drug Administration Phase 3 trial. For this product, the protein in plasma is purified. The good news for Therapure is that there’s a real demand for the product; the bad news is that large, established competitors dominate the crowded and mature marketplace. Newton Glassman’s carefully constructed world is starting to give way. Although the bevy of lawsuits initiated by Glassman is evidence that he’s not quietly accepting his professional setbacks or public criticism, investment managers and journalists should not be his biggest concern. In August The Wall Street Journal reported that at least four individuals had filed whistleblower complaints with Canadian securities regulators, including the Ontario Securities Commission, alleging fraud at Catalyst and Callidus. One of the whistleblowers told the Southern Investigative Reporting Foundation of the U.S. Securities and Exchange Commission interview on these matters. 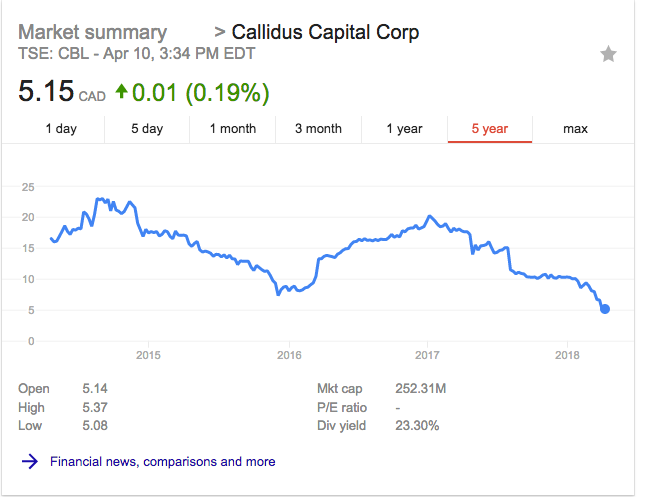 Callidus’ stock price flirts daily with all-time lows despite the company’s having spent an estimated CA$110 million for a series of share repurchases. And a pair of no-frills websites, Litigating With Catalyst Capital and Callidus Capital Litigation (owned and maintained by West Face and Kevin Baumann, respectively), offer an unflattering picture of Newton Glassman’s future: constant litigation, massive expenses and increasingly bruising defeats. 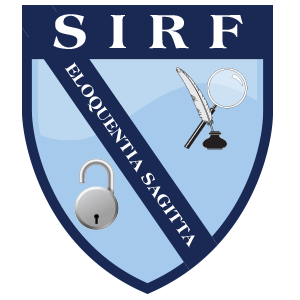 The Southern Investigative Reporting Foundation submitted detailed questions via email to Callidus and Catalyst spokesman Daniel Gagnier, but he didn’t reply. 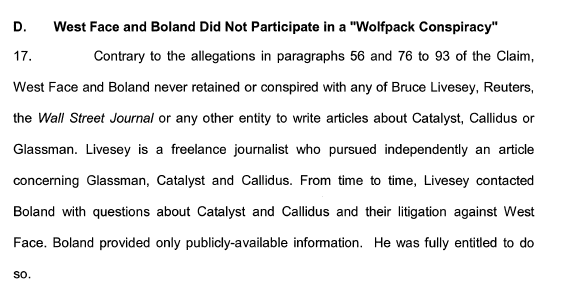 Editor’s note: In its CA$455 million “Wolfpack” conspiracy lawsuit, Catalyst claimed journalist Bruce Livesey was a member of a short selling conspiracy against Callidus. It specifically claimed that West Face had “retained” Livesey to write a negative story about Callidus. The allegations are entirely false: Livesey is an investigative reporter with 30 years of experience; he has never worked for West Face in any capacity. 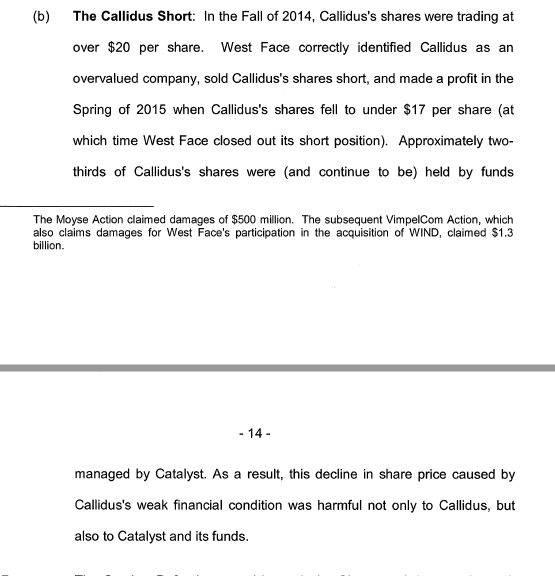 And West Face has completely denied Catalyst’s claim in court filings. 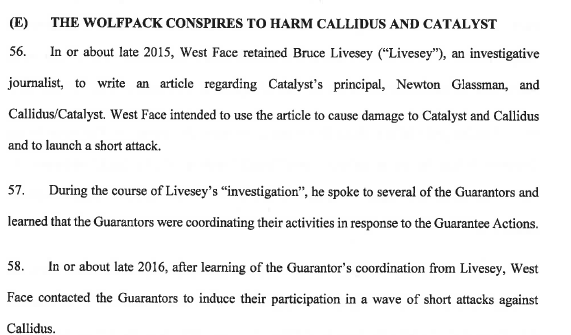 Catalyst attorney David Moore’s letter to the Southern Investigative Reporting Foundation also repeated the lawsuit claim that Livesey was part of a “Wolfpack” conspiracy. Moore sharply criticized Livesey, decrying “his use of expletives” and “an animus and agenda” against Glassman. Another A+ story by Sirf. I read this (and other related statements, comments and opinions) and decided to sell most of my shares today (I am hanging onto 1/4 of them in case I am wrong again, as I was in averaging down while listening to reassurances on BNN that CBL was in good shape ), even though they are all under water, and I held on for far too long (hoping that the market was off base). The new NCIB appears designed to steady the share price (rather than take advantage of unrealistic valuations)….in order to avoid becoming a penny dreadful. As mentioned elsewhere, there are not a lot of shares outstanding…..so it stands to reason that it wouldn’t take a lot of buying to support values (for a fair while). Only time will tell whether Mr. Glassman is able to stave off the wolves and right the ship…. he appears to have a significant challenge in front of him. The part of me that still holds approx 1000 shares hopes he is successful….the other part of me doesn’t like his business practices, and will accept further losses on my remaining holding. I would be curious to know what is the connection between Joseph Lewis/Braslyn and Newton Glassman. Braslyn not only was buying shares since 2016 but is a big reason Callidus pays a dividend as they take theirs in shares rather than cash.